Artists often incorporate mirrors into their sculptures, so we’ve chosen some of our favourites to show you the huge variety of work now on display. 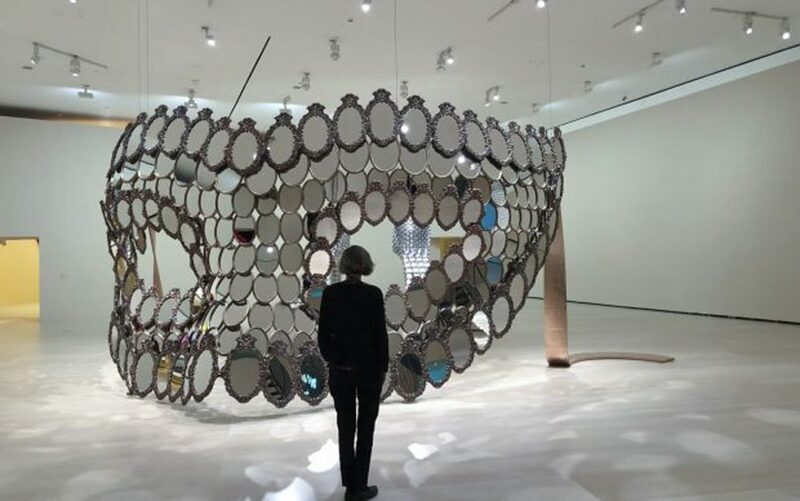 Portuguese artist Joana Vasconcelos is exhibiting a retrospective collection of her sculptural works spanning three decades at the Guggenheim Museum Bilbao entitled I’ll Be Your Mirror until November 2018. Her show title is a tribute to The Velvet Underground’s German vocalist Nico, exploring notions of femininity with thirty humorous, giant sculptures of everyday objects including a huge new bronze and mirror mask. 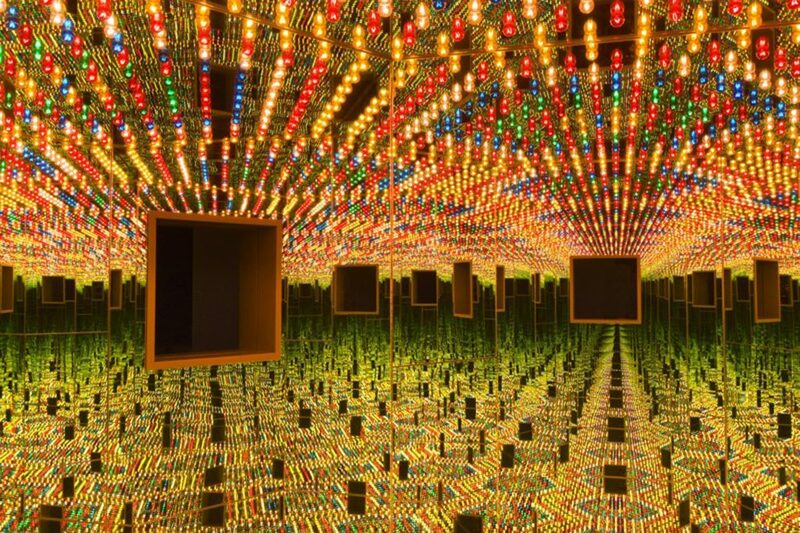 Japanese artist Yayoi Kusama is set to debut her new, larger Infinity Mirror Room installation (above) alongside other new sculptures and paintings at the Victoria Miro gallery in London from October to December 2018. 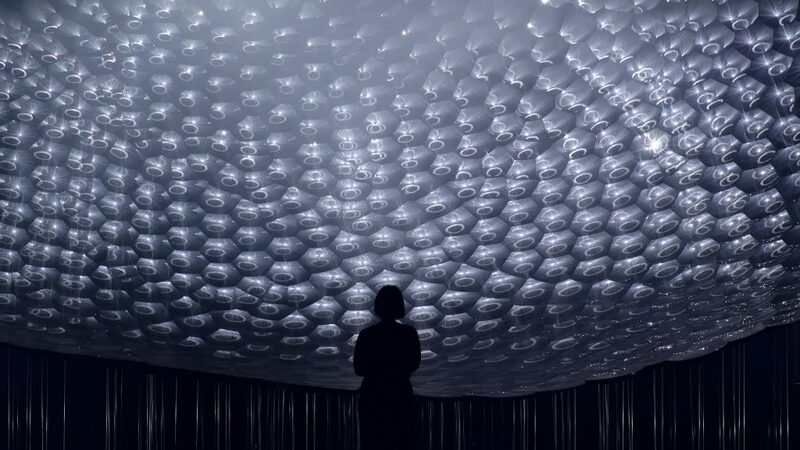 Her hugely popular Infinity Mirror Room installation, currently exhibited at Cleveland Museum Ohio, encases visitors in large mirrored rooms, which create the illusion of being suspended in endless space and immersed within infinite lights and sculptural forms, such as like her polka dot pumpkins and paper lanterns. Seoul artists Kimchi and Chips recently exhibited HALO at Somerset House London, an installation which redirects the sun’s rays from 100 motorised mirrors, sculpting the sunlight through fine water jets in a cloud of mist to create a halo floating in mid-air. Kimchi and Chips developed a mathematical model and virtual simulation of each mirror in collaboration with the scientific research division of Improbable Worlds, a technology company that focuses on large-scale simulations in clouds. In another recent installation – Light Barrier, Kimchi and Chips utilised eight architectural video projectors, which split into 630 sub-projectors using a structure of concave mirrors to create a phenomenon with projected light beams that merged in a haze and enabled them to draw in the air. The Danish artist Olafur Eliasson, known for sculptures and large-scale installations, is currently exhibiting a collection of works called The Unspeakable Openness of Things at the Red Brick Art Museum in Beijing. The large gallery spaces are presented as a series of immersive environments such as the huge, suspended, circular light within a bright mirrored hall.